Mathew Ingram stories at Techdirt. stories filed under: "mathew ingram"
In the midst of the political chaos in America and the world at large, a whole lot of attention has been turned to Facebook and its role in modern democracy. The social network has responded by announcing another round of news feed changes, the true impact of which (if any) remains far from clear. This week, we're joined by Mathew Ingram from the Columbia Journalism Review to talk about Facebook's changes, and whether we can or should expect them to fix anything. Update: The British Library has now apologized, noting that a staff member presented inaccurate info. The no camera rule is still there, but they admit it has nothing to do with copyright. On the whole, librarians tend to be really good on copyright issues, understanding the deeper nuances better than most. Apparently, however, the British Library -- or whoever runs their Twitter feed -- leans in the other direction. There was a bizarre exchange on Twitter today, kicking off with reporter Mathew Ingram, who is in NYC for a conference, tweeting a photo of the Periodicals Room at the NY Public Library, and noting that it was his "office this morning." 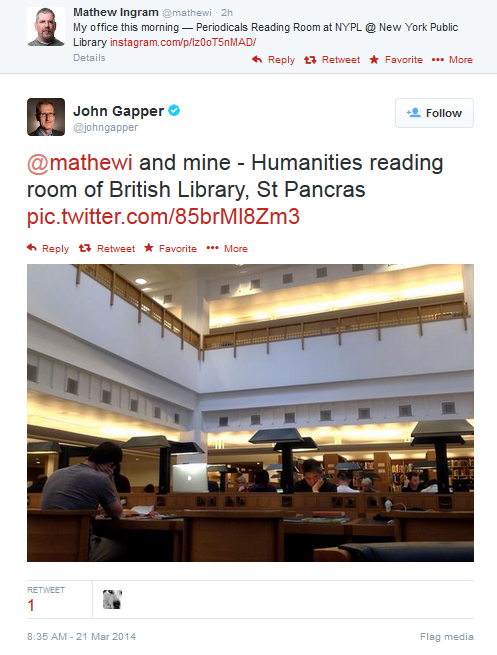 Another reporter, John Gapper, amusingly tweeted back a photo of his own "office" for the day, which happened to be the Humanities Reading Room at the British Library. All in all, a little slice of life moment that's often kind of fun to see on Twitter -- two reporters noting how they're working from public libraries, separated by an ocean, at the same time. Cool. Except... along comes the British Library with a ridiculous freakout. Its Twitter feed jumped into the conversation to demand that Gapper delete the photo as being against the conditions of use. As a bunch of others started asking why, whoever handles the Twitter account for the British Library Reference Service started tweeting out a bunch of nonsensical claims about copyright and other random arguments that make no sense. For collection items: copyright issues; for readers: they haven't given their permission to be photographed. All too often in debates about copyright issues, people get high and mighty about something they naturally assume to be true, using a sort of "because... copyright" argument. You'd hope that libraries and the people who work there would be more careful and knowledgeable, but apparently that doesn't apply to the British Library. Either way, point taken. Next time I'm in the UK, I'll find a friendlier "office for the day" than the confused British Library. Why Do We Celebrate The 'Solitary' Experience Of Books But Decry The Social Experience Of Online Social Media? We already wrote making people more lonely, but that same piece made Mathew Ingram go on a bit of rant on Twitter raising a good point. He noted that the same folks who decry social media for making people lonely often celebrate the importance of the solitary experience of reading books. He finds it odd that the solitary experience of reading books is seen as sacrosanct and notes that both experiences can be used to "escape from the real world." So why is one considered bad and one considered an important cultural point? I'd guess part of it is simply generational. As Douglas Adams has stated (I'm paraphrasing slightly), every tech around by the time you're born is "normal," new technology that is invented before you're thirty is cool and new and anything that gets invented after you're thirty is "against the natural order of things and the beginning of the end of civilization as we know it." It seems there's definitely an element of that happening here. Also, there's some view that talking to friends is just idle chatter... whereas reading a book is a "serious" thing from which you might learn. Of course, the fact that the most popular books are probably just as insight free as many online conversations is ignored. It's not like everyone reading books is digging into a meaty exploration of ways to solve all the world's problems. Either way, Mathew raises a good point. I'd be curious if someone can defend the importance of books while also defending the claim that social networking is useless without being self-contradictory.